Innovative HVAC restoration solution from Pure Air Control Services joins an elite group of 65 products and services showcased online at buildings.com. BUILDINGS has selected HVAC New Life restoration as a 2019 Money-Saving Products winner. The editorial staff evaluated finalists for their money-saving qualities. Criteria such as energy efficiency, water savings, and improved maintenance were important considerations. What is HVAC New Life? HVAC New Life combines proprietary and specialized services to restore aging mechanical equipment. Air handling units (AHUs) get cleaned and refinished to provide many more years of service. Thus, building owners can realize better HVAC performance without purchasing new equipment. Pure Air Control Services is an Indoor Air Quality (IAQ) driven firm. Improving building health, occupant comfort and energy efficiency is our focus. HVAC New Life provides a money-saving, sustainable, solution that meets this ethos. Here’s the essential components to a HVAC New Life project. This process uses high temperature and low pressure steam to deep clean HVAC coils. It removes debris that blocks airflow and decreases system performance. PURE-Steam also disinfects the AHU killing microbes and removing odors. The process is the only Green Clean Institute certified service of its kind. Its effectiveness proven in case studies and whitepapers. Refinishing an AHU requires materials that can stand up to rigors of HVAC operations. PURE-Coat is a water resistant and anti-microbial paint. It provides lasting protection to the metal components of an AHU. HVAC drain pans often bear the brunt of degradation over years of operations. After all, they are plain sheet metal, are always wet and can harbor microbes. Because of these conditions drain pans oxidize, rust and can even leak. PURE-Liner 2.0 provides a flexible, water resistant and anti-microbial finish. It restores the drain pan to better than factory conditions. Over time both exposed and double walled fiberglass insulation within an AHU can break down. This not only can cause performance issues such as leakage, but also pose an IAQ threat to occupants. Loose fiberglass can travel downstream and into occupied spaces. After a certain point, encapsulation of old insulation is not viable. PURE-Cell is a zero porosity, fiberglass free insulation. It possesses the same R-factors as fiberglass, has an excellent fir rating, and is easy to clean/maintain. HVAC New Life provides other money-saving incentives as well. Restoration requires less planning than replacement. It’s also not as disruptive to operations. This is because the entire system is not compromised during the process. AHUs get restored one at a time, often times outside of a facility’s normal hours of operation. So, there is no need for temporary cooling. HVAC new life also has a smaller carbon footprint than replacement. New equipment consumes resources to manufacture, ship and install. Not to mention the disposal of the old equipment. Finally, some energy companies provide rebates based on performance gains by PURE-Steam. All told, HVAC New Life costs about 1/10th that of new equipment. This is helpful to organizations that are looking to phase in new equipment. Restored AHUs perform better until their replacement arrives. Because the “useful lifespan” of the equipment increased CAPEX can fund restoration work. As an added benefit PURE-Coat and PURE-Liner 2.0 come with a 5-year warranty. 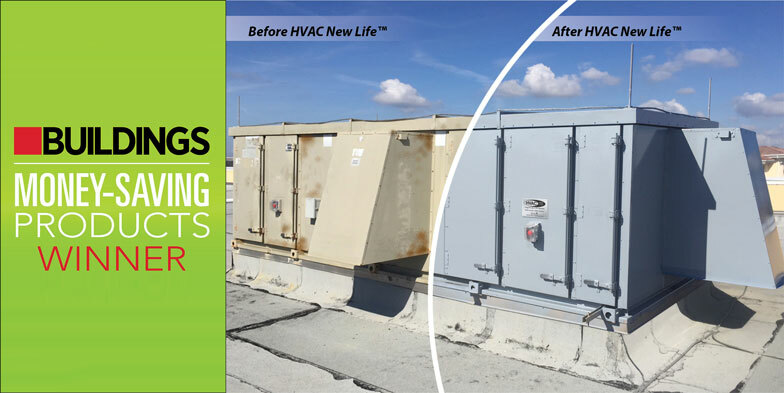 Pure Air Control Services is honored that the editors at BUILDINGS have recognized HVAC New Life as a money-saving product for 2019. For more information on HVAC New Life or to get started with a quote for your equipment please call 1-800-422-7873 or contact us via this website.